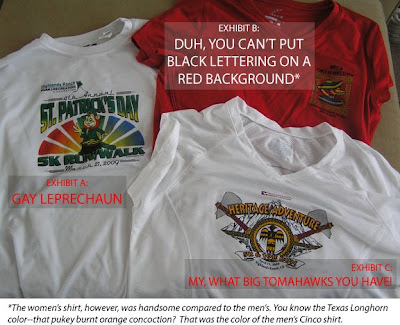 Me Too Marathon: HRCA Shirts: Fugly Revealed! Now, I realize there are shirts waaaaaaayyyy more fugly out there than these, but for those who cared to see, these are the 2009 HRCA race shirts that I think are just gross. True, they are all spelled correctly and yes, I have seen worse clipart in my time...but because it's my hood, I have special pride in these Highlands Ranch Run Series shirts. I want to feel proud wearing these around the greater Denver metro area. I want all those snooty Wash Park and Cheeseman Park runners to think, "Ah, maybe they have no yards and the houses are all soulless and beige down in the Ranch, but BY GOD they can make a nice race shirt!" And quite frankly, I think we can do much better here. And oh yeah, for the running part, I did 8.5 miles* on Sunday in 1:19. My hammies were a little sore yesterday after the weekend, so I took the day off. Today I will be celebrating Cindo de Mayo by taking my act to Wash Park to show off the lovely new red HRCA Cinco shirt. *I have noticed that my little Daily Mile calculator has not been calculating correctly the last couple of weeks...I will choose to believe this is because I have done so many miles that I've broken its will to calculate. So I am in search of a new simple blog calculating tool to tell me how much I am running so that I can continue to avoid all simple math for the forseeable future. ZOMG, sister, those shirts are so ugly they're making my EYES BLEED!1! Still ... I'd f*ck that red one. But NOT the leprechaun one because - pfffttt!! - you know the IRISH! All they wanna do is talk about their feelings afterward and I'm all like, "HEY! Your money's on the dresser! Now GET OUT!1!" I've used the training log at Runner's World for stats before. You won't see it on my blog now, umm, because I haven't been running. Like, at all. Maybe I should put it back up and shame myself into running? Yeah, that's what I'll do! Haha you're right; those are awful. Hahahaha! I LOVE the "gay leprechaun," because I have that same DAMN shirt! I hate it! And, it's so huge on me, even for a small. These race directors need to get it together! I'm not convinced they've even RUN before. If I were a race director, I'd do it right. It's a damn shame they don't let you preview these shirts before committing to the race! I agree with the shirt preview idea, 312%. Ooooo! I feel drrrty just typing that!